Christophe Claret is writing a new chapter in the history of Haute Horlogerie by launching Maestoso, an exceptional mechanical timepiece that pays vibrant tribute to watchmaking heritage, an ode to research and innovation. This timepiece boasts no fewer than three patents, the fruits of development conducted entirely in-house by Manufacture Claret, offering a new lease of life to the traditional pivoted detent escapement. 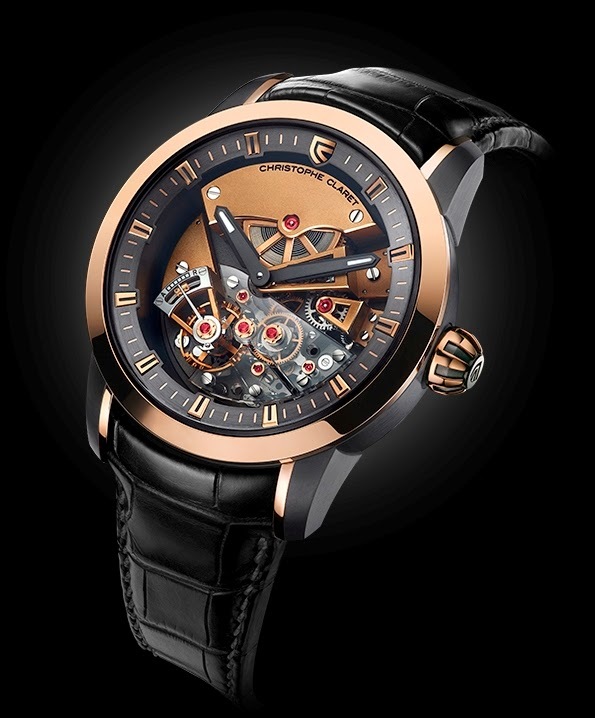 By creating this timepiece, Christophe Claret has succeeded to equip a wristwatch with a traditional detent escapement, a mechanism usually designed to run in a perfectly stabilized position. 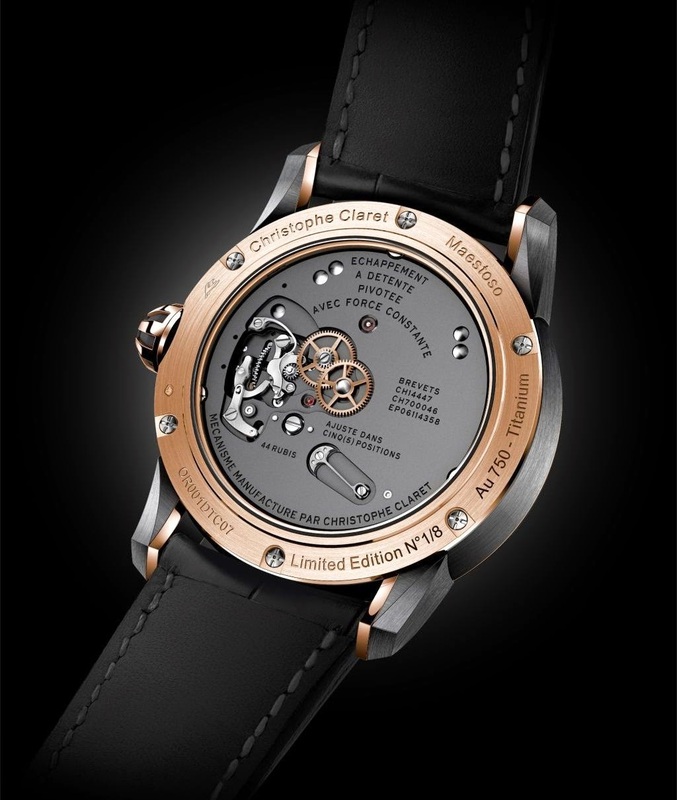 The whole watch – case, hands and all the parts of the movement, down to the balance spring – was designed, manufactured and assembled in Manufacture Claret’s workshops. Maestoso is one of the few watchmaking creations today to be equipped with a cylindrical balance spring; extremely difficult to make. True to the fine craftsmanship that the brand has always advocated, the timepiece is hand-finished in the purest Haute Horlogerie tradition. Perfection can be read in the details and in the technical and aesthetic challenges constantly taken on by the watchmakers in the Manufacture’s Soleil d’Or ateliers. This type of detent escapement first appeared in the 18th century, at a time when watchmakers were competing to create a time-measuring instrument of maximum precision, to be used to determine a ship’s exact geographical position at sea. Regarded as the quintessence of chronometric precision, even ahead of the tourbillon, this historic escapement is traditionally equipped with a laminated gold blade spring. 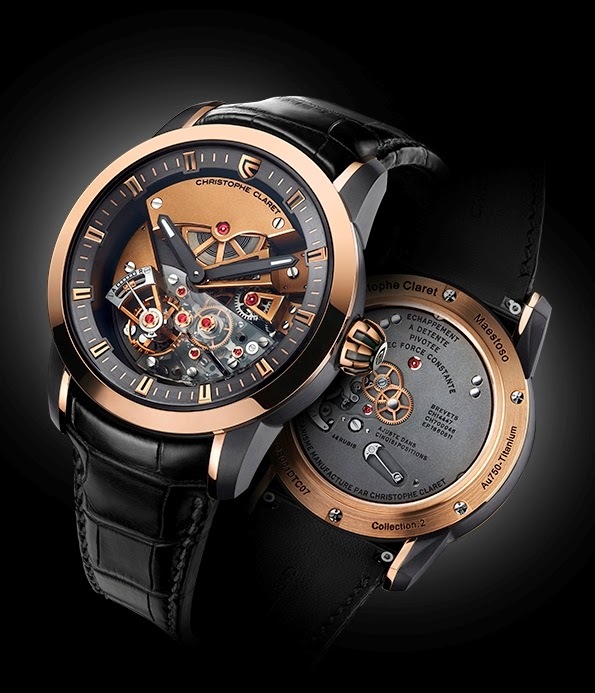 Christophe Claret has made sure to adhere to these specifications to the finest detail. At the time, it was found primarily in marine chronometers, mounted on gimbals to ensure an invariable position. Though it demonstrated exemplary reliability, it actually had the weakness of being particularly sensitive to lateral impacts. There is a considerable challenge: the slightest shock to a detent escapement can cause it to stop or even release the escape wheel and break. Another danger is overbanking, in which an external shock, or even setting the time, can cause the balance wheel to oscillate with excess amplitude, i.e. more than 360°, causing a second impulse. This can speed up the escapement wheel and disrupt timing. 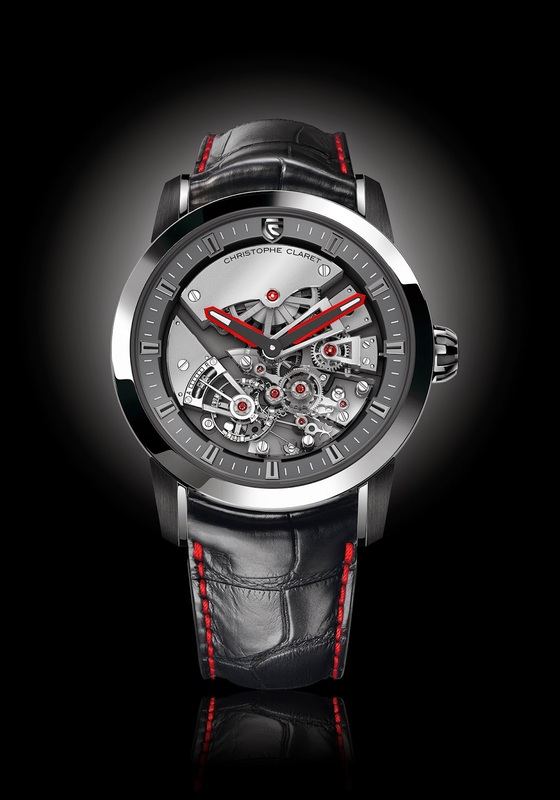 Enabling the mechanism to operate in all the positions that wearing a wristwatch entails – without resorting to the convenience of a modern, shorter detent – is a genuine gamble, pulled off via the three patents and a series of additional innovative systems. To prevent the detent from turning over, an anti-pivot cam, integral to the spring balance, works in conjunction with the safety finger. The ensemble is fitted between a mainplate and two sapphire bridges, and pivots on a ball bearing – a patented mechanism – that distributes the load on the escapement. So it absorbs the impacts by means of a spring that provides the requisite flexibility. 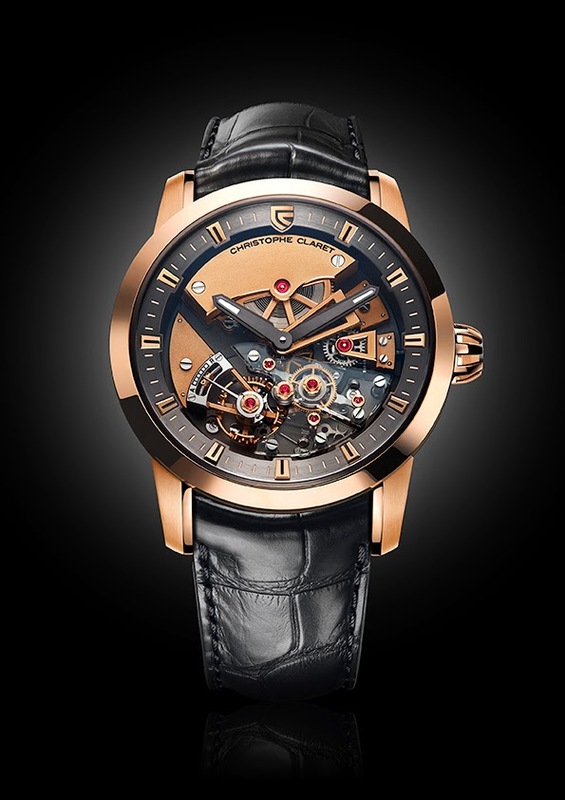 The upper bridge, crafted from sapphire crystal, allows the intrinsic beauty of the mechanism to be fully appreciated. To cope with the risks of over-banking, a flexible thrust bearing fitted on the wheel and connected to the balance absorbs any excess energy. Christophe Claret has also endowed the watch with a constant force, guaranteeing stable energy and amplitude throughout the power reserve. Thus the constant force spring, wound up by the barrel, always releases the same energy at regular intervals, making the torque to the escapement more constant. Finally, a stop seconds, another patented device, also plays an essential role by stopping the balance when setting the time. Besides these ingenious additional systems, a micrometric worm screw on the regulator, also patented, is used to regulate the timing rate. Visible at 8 o’clock, the mechanism combines performance with design. 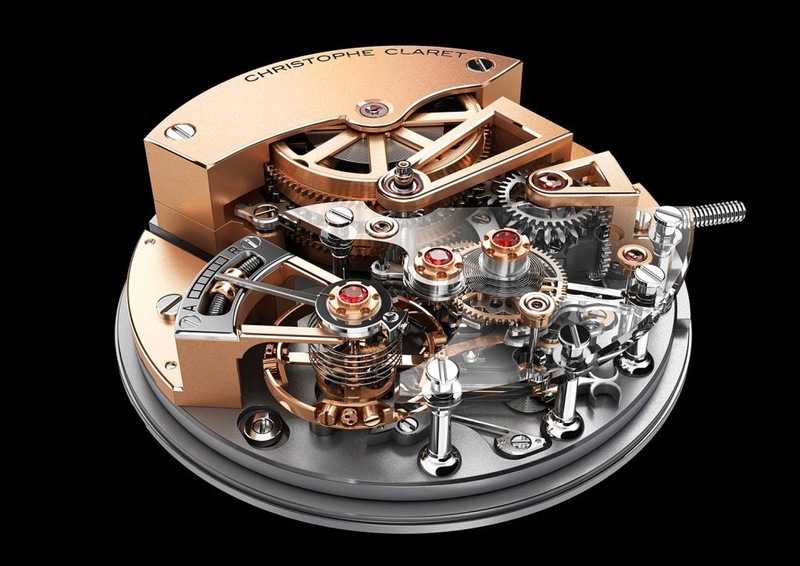 Maestoso is also equipped with two mainspring barrels, each with two superimposed springs transmitting force to the regulator and providing an optimal power reserve of more than 80 hours. Inside the precious 44mm diameter case, the graduated flange bears applique indexes, with the logo of the brand subtly appearing as the 12 o’clock mark. 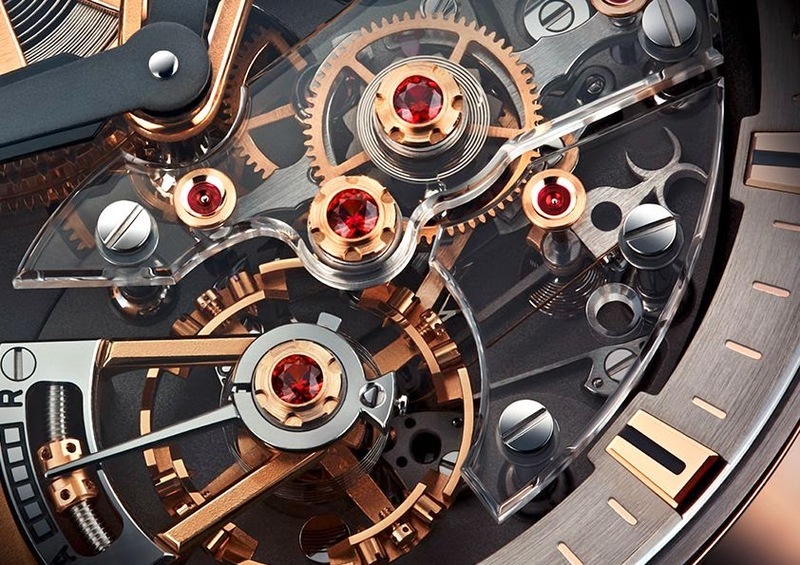 The transparency of the bridges turns the spotlight on the detent escapement and constant force mechanism. The pillars sculpted in the form of ruffs, inspired by watches from the time ofLouis XIV, open up a lateral view of the mechanism. The bridges are inspired by Charles X. 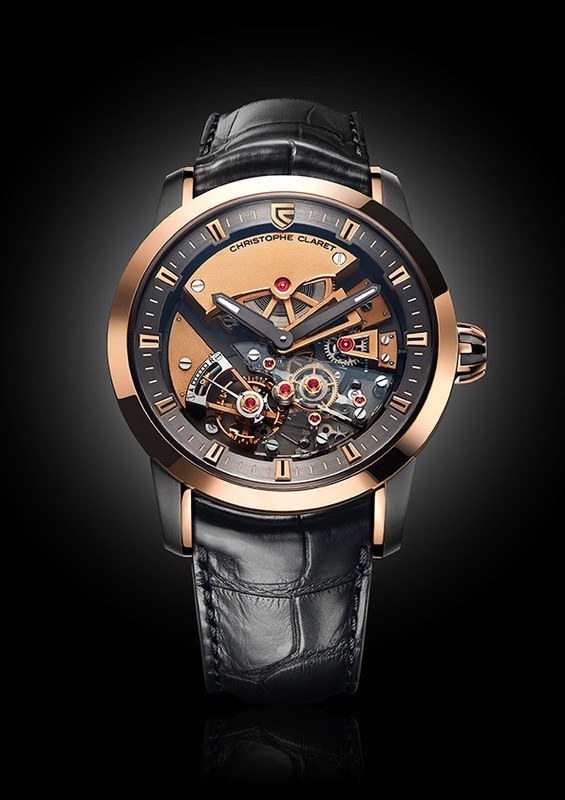 The aesthetic coherence with Christophe Claret’s Soprano is striking. All the functional elements of the decoration, such as the gold chatons cradling the jewels, play in concert for a captivating show, masterfully orchestrated by the DTC07 caliber. The hour and minute hands, emblematic of the brand, are enhancedby a luminescent coating and fly majestically over the movement. Made from titanium and rubies, the hands echo the set jewels. The Maestoso is available in 5N red gold, anthracite PVD titanium with white gold, or anthracite PVD titanium with red gold.